Otitis media with effusion (OME) is a condition that most commonly affects children. It is caused by the build-up of a viscous inflammatory fluid within the middle ear, resulting in a conductive hearing impairment. In this article, we shall look at the aetiology, clinical features and management of otitis media with effusion. In children, otitis media with effusion is usually caused by a combination of chronic inflammatory changes and Eustachian tube dysfunction. The condition is less common in adults, but normally results from blockage of the Eustachian tube, either from infective causes or from occlusive masses*. *Consequently, any new cases of unilateral OME in adults should be investigated as a ‘red flag’ for a malignant underlying cause. 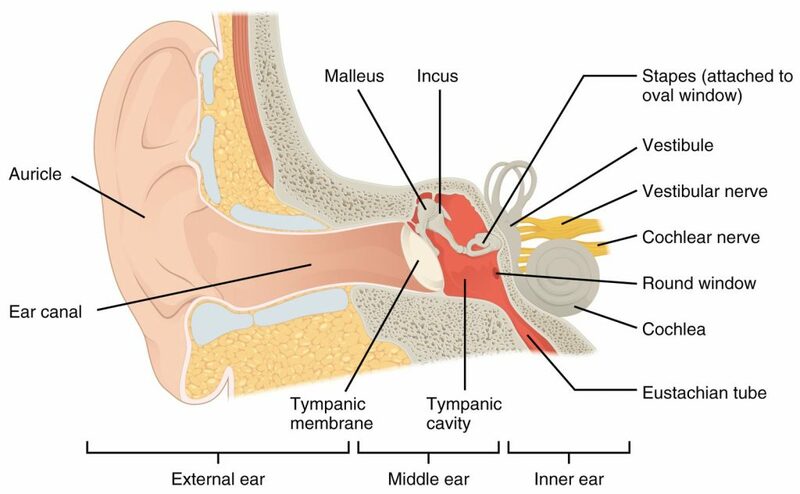 Figure 1 – Overview of the ear. Dysfunction of the Eustachian tube (bottom right) is associated with a large proportion of cases of otitis media with effusion. The most common clinical feature of otitis media with effusion is difficulty hearing (affecting one or both ears) and representing a conductive hearing loss. In young children this may be noticed as difficulty with attention at school or poor speech and language development. There may be a sensation of pressure inside the ear that may be accompanied by ‘popping’ or ‘crackling’ noises. Less commonly, the patient can also experience disequilibrium and vertigo. On examination, the tympanic membrane will appear dull and the light reflex will be lost, indicating fluid in the middle ear. The external ear will be normal. In most cases, otitis media with effusion is diagnosed clinically on the basis of history and otoscopy findings. If investigations are required, pure tone audiometry will reveal a conductive hearing loss. Tympanometry will show a reduced membrane compliance (a type B tracing). In adults, a full ENT examination should be performed, including flexible nasoendoscopy (to exclude a post nasal space mass). Otitis media with effusion in children can be managed in an outpatient setting. Approximately 50% of cases will resolve within 3 months; hence many cases are managed by ‘active surveillance’. Non-surgical – hearing aid insertion. Surgical – myringotomy and grommet insertion. In the UK, NICE guidance recommends the insertion of Grommets for those with >3months of bilateral OME and hearing level in better ear <25-30dBHL. Which of the following is a risk factor for Otitis Media with Effusion? Which of the following is least helpful in assessing a 47yr old male with otitis media with effusion? What are the current indications for grommet insertion?